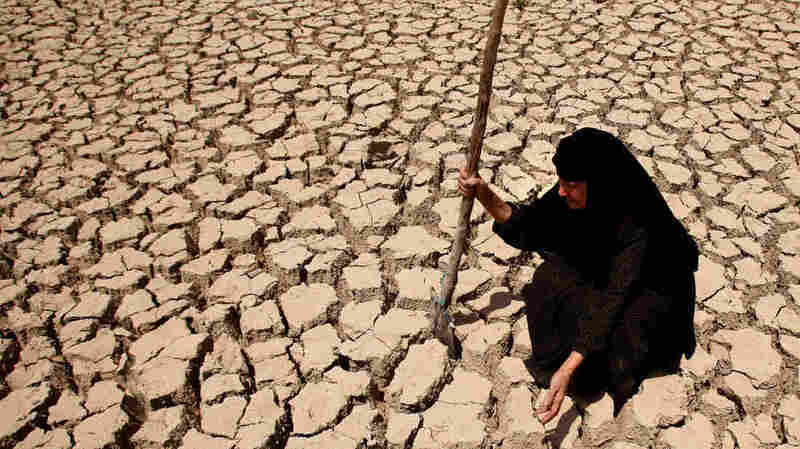 Mideast Water Crisis Brings Misery, Uncertainty The Middle East is facing its worst water crisis in decades. For three summers, the annual rains have failed to come. Farmland has dried up in Iraq, Syria, southeast Turkey and Lebanon. The dire conditions are creating a new phenomenon: water refugees. Adilla Finchaan, 50, checks her drought-stricken land in Latifiyah, about 20 miles south of Baghdad, in this photo taken in July 2009. Below-average rainfall and insufficient water in the Euphrates and Tigris rivers — something the Iraqis have blamed on upstream dams in Turkey and Syria — have left Iraq bone-dry for a second straight year. The Middle East is facing its worst water crisis in decades. For three summers, the annual rains have failed to come. Farmland has dried up across the region in Iraq, Syria, southeast Turkey and Lebanon. While oil was the resource that defined the last century, water and its scarcity may define this one. Experts say the climate is warming in the Fertile Crescent, the area of the Tigris and Euphrates rivers, contributing to the water shortage and helping to create a new phenomenon — water refugees. Droughts for several consecutive years and the damming of the Tigris and Euphrates rivers have the Middle East facing its worst water crisis in decades. This winter, rain has barely settled into the hard, cracked farmland in northern Syria. There was a time when the fields were green most of the year, but the summer droughts have taken a toll. Farther east is the Badia, a vast rangeland, where thousands of people tend herds of sheep. Addami is a traditional village where the houses are white domes of baked clay. This summer, Addami was completely abandoned during the driest months. 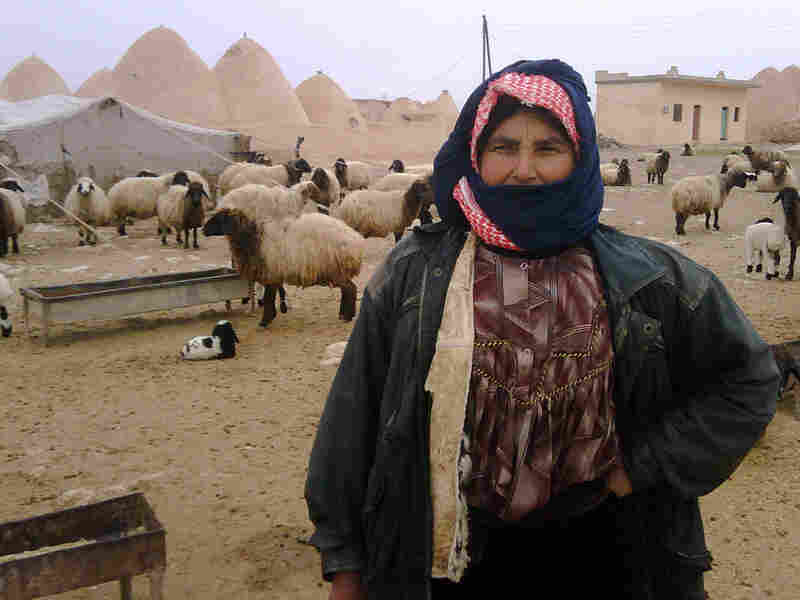 "There was no water and too much sand," says villager Nofa Hamid, 51, who has been tending sheep since she was a child. "It got into everything, even the kitchen." "It was crazy; the sand was everywhere this summer," she says. Life has never been easy in Addami. But Ismar Mohammed, a 43-year-old shepherd wrapped in a black wool robe against the cold, says he was wealthy by local standards as the owner of the area's largest herd. He had to drive his flock more than 150 miles for water. With no luck and no grass, he had to buy feed for his 275 sheep, and that meant he had to sell some of them to feed the rest. "No question, I had to do this otherwise they would die, and I had to feed my kids. Before the drought, I used to have 400 head," he says. "No question, we were doing fine, just except for this drought, which is affecting us very badly," he says." More than 160 villages are abandoned now in Syria alone. According to a United Nations report on the drought, 800,000 people have lost their livelihood. Hundreds of thousands left once-fertile land that turned to dust and pitched tents near the big cities, looking for any kind of work. Nofa Hamid, 51, has been tending sheep since she was a child. Her Syrian village, Addami, was completely abandoned during the driest months of the drought. "It was crazy; the sand was everywhere this summer," she says. "It's an emergency," says Syrian economist Nabil Sukkar. "If we have two more years of drought, then we do ... have a crisis." Formerly with the World Bank, Sukkar now heads a private consulting firm for development and investment. He has been researching the emergency, including its economic and social costs. "I've gone out and I saw some people in the tents. I told them, 'From where you are coming? How do you manage?' They said, 'We find short-term work,' but this is not sustainable," he says. The mass migration to the cities has created a new community of displaced people across Syria and Iraq. "Water scarcity is forcing people off the land," says Hussein Amery, an expert on Middle East water management and a professor at the Colorado School of Mines. He says the policy failures that have made the emergency worse. "Therefore, these refugees are very much water refugees, they are a product of water scarcity in the region," Amery says. He says the water crisis has been building for years. "The water refugees are a product of climate change, mismanaged water resources. It's a product of population explosion; it's a lot of things. It's a perfect storm that is wreaking havoc in the rural farming sector of Syria and Iraq," he says. Due east of the Syrian capital, Damascus, is the city of Palmyra, a popular tourist destination. The city's ancient Roman ruins are a draw for Japanese tourists — and a livelihood for the locals. Palmyra, hit hard by the drought, is also the headquarters for the Syrian government response. Emergency measures include food aid for families and low-cost loans for farmers. At the government office for development, Mohsan Nahas says Palmyra is experimenting with new water-saving techniques. "I have talked about the oasis we've been setting up. That's being done with drip irrigation," he says. Nahas offers visitors a slideshow to illustrate what he is up against — a dust storm so large it could be seen from space on Google Earth. Conditions on the ground were intolerable: Sand blew into houses, mixing with food and affecting people's eyesight. With the widespread drought, a food crisis is looming. For the first time, Syria now has to import wheat. Sukkar, the economist, says things won't get better unless the country changes a history of wasteful water management and outdated farming techniques. "Unfortunately, we haven't introduced modern technology, and so we are dependent on rainfall, period," he says. But rainfall, or lack of it, is not the only culprit, he says. Syria and Iraq blame Turkey's huge network of dams on the Tigris and Euphrates rivers for reducing water supplies by 50 percent. Turkey is the site of the headwaters of a river system that Syria and Iraq depend on. An informal agreement determines the flow downstream. "When we had bad relations with Turkey, they reduced the flow of water despite the agreement, and now, thank God, we have excellent relations with Turkey, and hopefully, we will not see any cutoff of water," Sukkar says. Turkey says there is enough water for everyone, but Syria and Iraq waste their share. Amery, the water expert, says the Turks are partly right. "The issue is water but it goes far beyond water," he says. Amery says the key to head off a water crisis is more efficient management of a scarce resource. But he adds politics, not climate, is the problem. "A lot of Arabs believe that Turkey is trying to assert itself as a regional superpower," he says, "and water is being used as a tool to advance that interest."